Let's face it; even the highest quality power tools will need some TLC at some point. 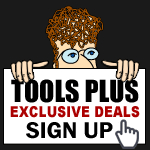 When that time comes, Tools-Plus.com has your back with the most popular replacement tool parts from top manufacturers like Milwaukee, Makita and Black & Decker. All our tool parts are genuine replacement parts from the manufacturers.